The Hall of the Priests. Mount Moriah, known as the "Har ha-Bayit" (Mount of the House), had an area of 500 × 500 cubits or ells (1 cubit = 21.85 inches). It was lowest on the east side, rising gradually to its highest point on the west, and was walled on all sides. The main entrance was on the south, and consisted of two gates near the center, the one on the right for admission, and the other for exit. The two gates were named "Huldah," after the prophetess who used to preach there to the people; the space on this side being the greatest, 265 cubits in width. The next largest space, 115 cubits, was on the east side. 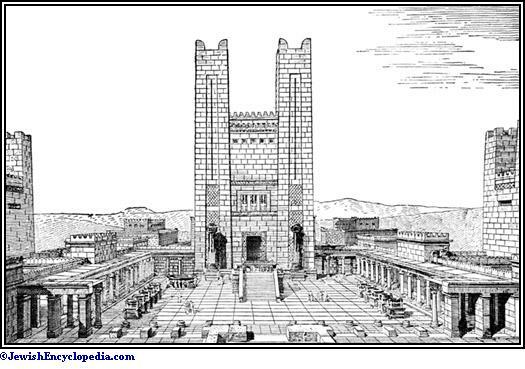 The eastern gate was called "Shushan" because it bore a model of Susa, the capital of Persia, in recognition of the permission given by that government to rebuild the Temple. The entrance on the north was through the "Tadi" gate, i.e., the gate of obscurity or privacy, it being used only by those who were ceremonially unclean and by mourners and those under the ban. The space on this side was 100 cubits. The space on the west was the least of all, measuring only 63 cubits to the court wall. The gate on this side was called "Ḳiponus," meaning "garden bower," from the fact that Joshua planted on its site the herbs, etc., from which the ingredients for the incense were derived. Each gate was 10 cubits wide and 20 cubits high. The height of the walls above the gates is not recorded; but it does not appear that they were raised much above the lintels. The Tadi gate had no lintel, but was triangular in shape, this distinguishing it as a private entrance. The walls were all 5 cubits thick and of a uniform height. From the eastern side of the mount, which, as stated above, was the lowest, a flight of steps, consisting of thirty-nine of a rise of ½ cubit each and one of 1 cubit (total, 20½ cubits), gave access to the floor of the Hekal, which was nearly level with the top of the eastern wall, rendering it easy for the priest to observe the inside of the Holy of Holies while standing on Mount Olivet opposite the eastern gate, when he sprinkled the ashes of the red heifer in the direction of the Sanctuary. 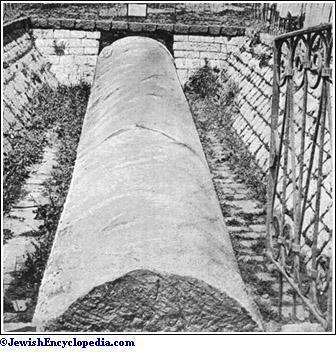 Column from the Temple of Herod. (From a photograph by the Palestine Exploration Fund. )The Soreg. A reticulated fence of sticks, called "soreg," 10 handbreadths in height and at a distance of 10 cubits from the outer wall of the courts, surrounded theTemple. This fence was on the edge of the foundation of the platform called "ḥel," which was between the fence and the courts. The soreg served as a barrier beyond which Gentiles and the ceremonially unclean might not pass (Kelim i. 8); and it was provided with a guarded entrance opposite each gate of the courts. The exclusion of Gentiles angered the Greeks, who, when they gained control over the Jews, made thirteen openings in the soreg; but after the Maccabean victory these breaches were repaired. Leading up from the ḥel to the courts were twelve marble steps, each of ½ cubit rise. These steps were protected from the sun and rain; and on them the people sat and rested (Pes. 13b). 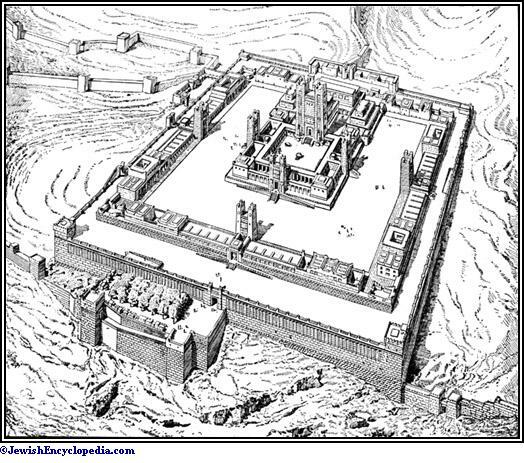 Within the soreg were the courts: the outer court, known as "'ezrat nashim" (women's hall), to the east, and the inner court, the Temple enclosure, to the west. The two together measured 135 × 322 cubits, the dimensions of the outer court being 135 × 135 cubits and those of the inner one 135 × 187 cubits. The Temple service was conducted in the inner court, the outer one being used mainly for the gathering of the people, including women (hence its name), especially during the celebration of the water libation at the close of the first day of Sukkot, when the women occupied the galleries above ( see Gallery). This court contained four unroofed chambers, one at each corner, each measuring 40 × 40 cubits. They were used as follows: (1) that on the southeast as the Chamber of the Nazarites, where, after the expiration of their terms, the Nazarites cooked their peace-offerings and burned their superfluous hair; (2) that on the northeast as the Chamber of Wood, where fuel for the altar and the hearth was stored; (3) that on the northwest as the Chamber of the Lepers, where, after they had been cured and had bathed on the eighth day of their purification, lepers remained prior to their admittance to the inner court for the anointing of their toes, etc. ; (4) that on the southwest as the Chamber of Oils, in which oil for the candlestick and the meal-offering, as well as wine for the libation, was kept. (Reconstructed by Chipiez. )The Hall of the Priests. The inner court, with the Nicanor gate in the center, was 7½ cubits higher than the outer one, and was connected with the latter by fifteen steps (eachof ½ cubit rise). On these steps the Levites sang the "hymns of degrees," fifteen in number (Ps. cxx.-cxxxv. ), corresponding with the number of steps (Yoma 38a); these were recited at the festival of the rejoicing of the water (Suk. 51b). Several chambers built under the inner court opened on either side of the staircase into the outer court below; among these were two music chambers for the Levites. In the inner court above were two chambers, one on each side of the Nicanor gate. On the right was the Chamber of Phinehas, the vestment-keeper, who had charge of the priests' lockers built in the wall and who arranged for the 24 patrols ("mishmarot"; Tamid v. 3). To the left was the Chamber of the Pancake-Makers ("'ose ḥabittim"), where twelve cakes were prepared daily, six for the morning and six for the afternoon sacrifice (ib. i. 3). The high priest had a special chamber called "lishkat parhedrin" (πάρεδροι = "assessors" ) = "the Counselors' Chamber" (Yoma 10a). The inner court was divided. On the east was the Israelites' hall ("'ezrat Yisrael"), 135 × 11 cubits; and on the west the priests' hall ("'ezrat kohanim"). Slats or sticks, also a step of 1 cubit rise, divided the priests' hall from that of the Israelites. In front of the priests' hall stood the dais ( Dukan), three stone steps, from the highest of which the priests blessed the people. This hall contained also several chambers (Mid. v. 16). The space between the priests' hall and the vestibule of the Temple proper was 54 cubits. 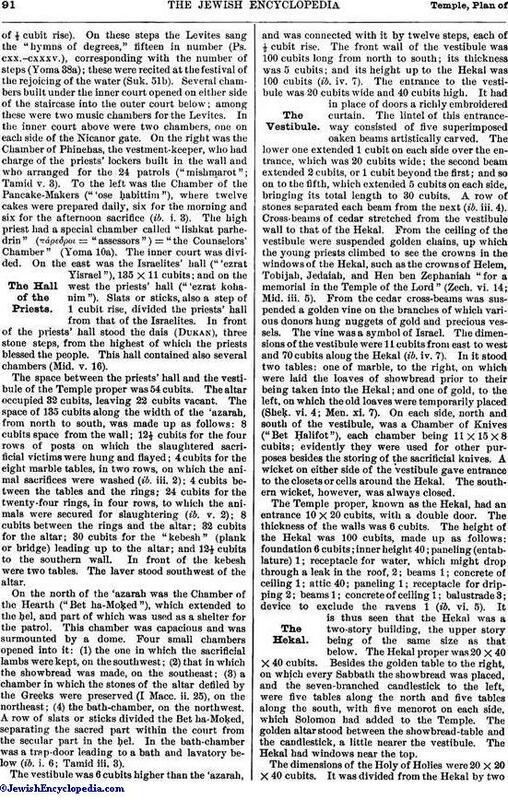 The altar occupied 32 cubits, leaving 22 cubits vacant. The space of 135 cubits along the width of the 'azarah, from north to south, was made up as follows: 8 cubits space from the wall; 12½ cubits for the four rows of posts on which the slaughtered sacrificial victims were hung and flayed; 4 cubits for the eight marble tables, in two rows, on which the animal sacrifices were washed (ib. iii. 2); 4 cubits between the tables and the rings; 24 cubits for the twenty-four rings, in four rows, to which the animals were secured for slaughtering (ib. v. 2); 8 cubits between the rings and the altar; 32 cubits for the altar; 30 cubits for the "kebesh" (plank or bridge) leading up to the altar; and 12½ cubits to the southern wall. In front of the kebesh were two tables. The laver stood southwest of the altar. On the north of the 'azarah was the Chamber of the Hearth ("Bet ha-Moḳed"), which extended to the ḥel, and part of which was used as a shelter for the patrol. This chamber was capacious and was surmounted by a dome. Four small chambers opened into it: (1) the one in which the sacrificial lambs were kept, on the southwest; (2) that in which the showbread was made, on the southeast; (3) a chamber in which the stones of the altar defiled by the Greeks were preserved (I Macc. ii. 25), on the northeast; (4) the bath-chamber, on the northwest. A row of slats or sticks divided the Bet ha-Moḳed, separating the sacred part within the court from the secular part in the ḥel. In the bath-chamber was a trap-door leading to a bath and lavatory below (ib. i. 6; Tamid iii. 3). The vestibule was 6 cubits higher than the 'azarah, and was connected with it by twelve steps, each of ½ cubit rise. The front wall of the vestibule was 100 cubits long from north to south; its thickness was 5 cubits; and its height up to the Hekal was 100 cubits (ib. iv. 7). The entrance to the vestibule was 20 cubits wide and 40 cubits high. It had in place of doors a richly embroidered curtain. The lintel of this entrance-way consisted of five superimposed oaken beams artistically carved. The lower one extended 1 cubit on each side over the entrance, which was 20 cubits wide; the second beam extended 2 cubits, or 1 cubit beyond the first; and so on to the fifth, which extended 5 cubits on each side, bringing its total length to 30 cubits. A row of stones separated each beam from the next (ib. iii. 4). Cross-beams of cedar stretched from the vestibule wall to that of the Hekal. From the ceiling of the vestibule were suspended golden chains, up which the young priests climbed to see the crowns in the windows of the Hekal, such as the crowns of Helem, Tobijah, Jedaiah, and Hen ben Zephaniah "for a memorial in the Temple of the Lord" (Zech. vi. 14; Mid. iii. 5). From the cedar cross-beams was suspended a golden vine on the branches of which various donors hung nuggets of gold and precious vessels. The vine was a symbol of Israel. The dimensions of the vestibule were 11 cubits from east to west and 70 cubits along the Hekal (ib. iv. 7). In it stood two tables: one of marble, to the right, on which were laid the loaves of showbread prior to their being taken into the Hekal; and one of gold, to the left, on which the old loaves were temporarily placed (Sheḳ. vi. 4; Men. xi. 7). On each side, north and south of the vestibule, was a Chamber of Knives ("Bet Ḥalifot. "), each chamber being 11 × 15 × 8 cubits; evidently they were used for other purposes besides the storing of the sacrificial knives. A wicket on either side of the vestibule gave entrance to the closets or cells around the Hekal. The southern wicket, however, was always closed. 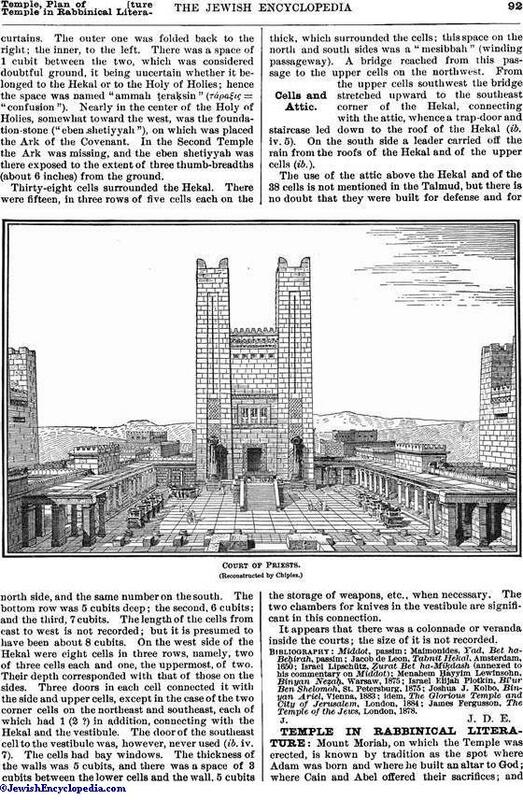 The Temple proper, known as the Hekal, had an entrance 10 × 20 cubits, with a double door. The thickness of the walls was 6 cubits. The height of the Hekal was 100 cubits, made up as follows: foundation 6 cubits; inner height 40; paneling (entablature) 1; receptacle for water, which might drop through a leak in the roof, 2; beams 1; concrete of ceiling 1; attic 40; paneling 1; receptacle for dripping 2; beams 1; concrete of ceiling 1; balustrade 3; device to exclude the ravens 1 (ib. vi. 5). It is thus seen that the Hekal was a two-story building, the upper story being of the same size as that below. 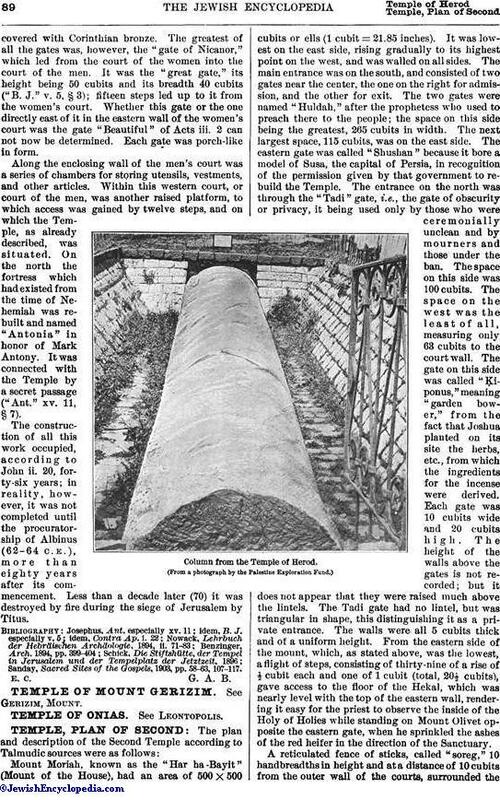 The Hekal proper was 20 × 40 × 40 cubits. Besides the golden table to the right, on which every Sabbath the showbread was placed, and the seven-branched candlestick to the left, were five tables along the north and five tables along the south, with five menorot on each side, which Solomon had added to the Temple. The golden altar stood between the showbread-table and the candlestick, a little nearer the vestibule. The Hekal had windows near the top. 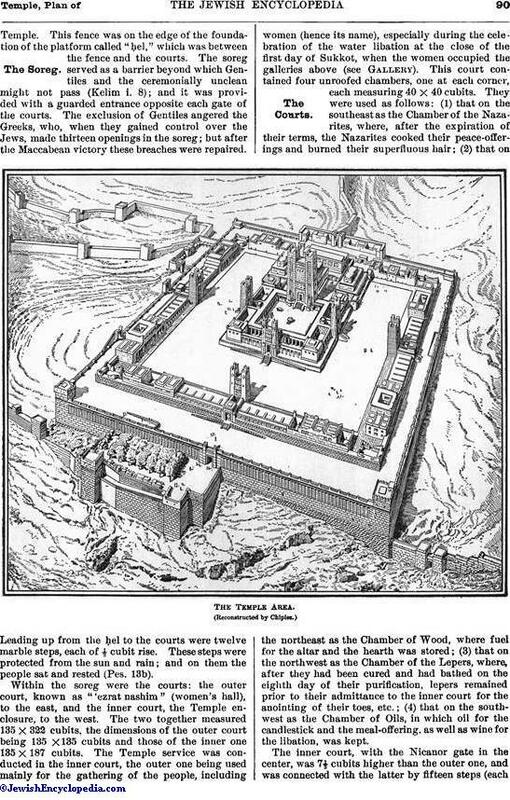 The dimensions of the Holy of Holies were 20 × 20 × 40 cubits. It was divided from the Hekal by twocurtains. The outer one was folded back to the right; the inner, to the left. There was a space of 1 cubit between the two, which was considered doubtful ground, it being uncertain whether it belonged to the Hekal or to the Holy of Holies; hence the space was named "ammah ṭeraḳsin" (τάραξις = "confusion"). Nearly in the center of the Holy of Holies, somewhat toward the west, was the foundation-stone ("eben shetiyyah"), on which was placed the Ark of the Covenant. In the Second Temple the Ark was missing, and the eben shetiyyah was there exposed to the extent of three thumb-breadths (about 6 inches) from the ground. Thirty-eight cells surrounded the Hekal. There were fifteen, in three rows of five cells each on the north side, and the same number on the south. The bottom row was 5 cubits deep; the second, 6 cubits; and the third, 7 cubits. The length of the cells from east to west is not recorded; but it is presumed to have been about 8 cubits. On the west side of the Hekal were eight cells in three rows, namely, two of three cells each and one, the uppermost, of two. Their depth corresponded with that of those on the sides. Three doors in each cell connected it with the side and upper cells, except in the case of the two corner cells on the northeast and southeast, each of which had 1 (2?) in addition, connecting with the Hekal and the vestibule. The door of the southeast cell to the vestibule was, however, never used (ib. iv. 7). The cells had bay windows. The thickness of the walls was 5 cubits, and there was a space of 3 cubits between the lower cells and the wall, 5 cubits thick, which surrounded the cells; this space on the north and south sides was a "mesibbah" (winding passageway). A bridge reached from this passage to the upper cells on the northwest. From the upper cells southwest the bridge stretched upward to the southeast corner of the Hekal, connecting with the attic, whence a trap-door and staircase led down to the roof of the Hekal (ib. iv. 5). On the south side a leader carried off the rain from the roofs of the Hekal and of the upper cells (ib.). The use of the attic above the Hekal and of the 38 cells is not mentioned in the Talmud, but there is no doubt that they were built for defense and for the storage of weapons, etc., when necessary. The two chambers for knives in the vestibule are significant in this connection. It appears that there was a colonnade or veranda inside the courts; the size of it is not recorded. James Fergusson, The Temple of the Jews, London, 1878.